Despite being border states, Iowa (7-5) and Missouri (10-2) have not met in football since 1910. The two programs had scheduled a four-year series from 2005 through 2008, but Missouri backed out of the first two years to schedule other opponents, leading Iowa to void the final two years on the deal. For the program administrators at that time, this led to some hard feelings. Click Read More for the full preview & video. On the field, Iowa finished 7-5 with the five losses by a total of 18 points while the Hawkeyes were tied or led in the fourth quarter of each. In the weeks leading up this match-up Iowa has seen their all-time leading receiver in yards and catches, Derrell Johnson-Koulianos, arrested on drug charges, RB Jewel Hampton request a transfer out of the school, along with speculation surrounding the status of fellow RB Adam Robinson. After back-to-back losses at Nebraska and Texas Tech, Missouri won their final three games of the season to claim a share of the Big 12 North Championship. Among BCS programs, the Tigers have the seventh highest win total from 2007-10 with 40 wins. Under head coach Gary Pinkel, Mizzou claimed big victories this season against then BCS #1 Oklahoma and at Texas A&M. Will Missouri roll on to their eleventh win of the season? Or will Iowa find a way to prevail after a season of heart-breaking defeats? Watch the game December 28 at 10 PM ET on ESPN. It says I voted already but I didn't, I pick mizzo, Iowa is missing some weapons on offense for this game. Yeah I chose Iowa and it says I picked Mizzou? I chose Mizzou and it says I picked Iowa. 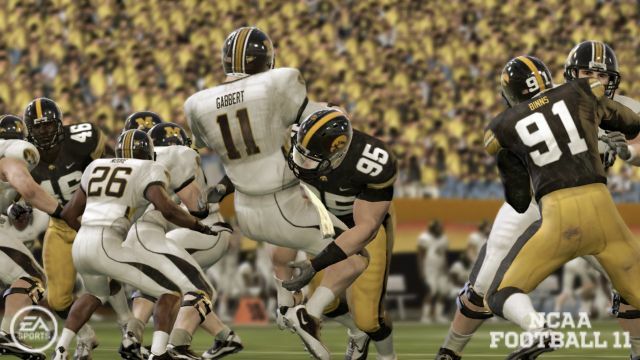 I like the sim a lot in this one, Mizzou by 7-10 sounds about right. Lol, that is funny. I like mizzou by about the same cdj.